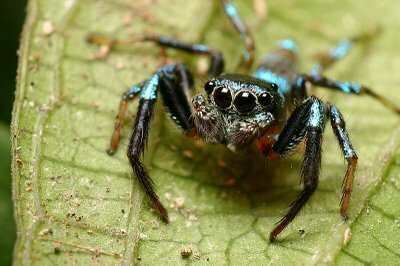 Thania bhamoensis Thorell,an iridescent jumping spider species , commonly known as fighting Spiders is know for its aggressive behaviour towards its males counterpart. 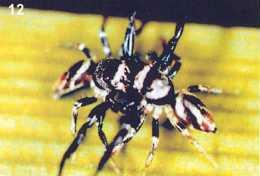 In the picture below an example of two male fighting spiders . I used to keep male fighting spiders (Thania bhamoensis) during my secondary school days and I would bring them to school every day to challenge my peers’ spiders. I was very amazed about these spiders threat display during the fighting . And this curiousity have partly spur me to take up LSM1303 in NUS to understand more about animal behaviour. During this couse of study, I learn about these spiders fighting engagement process and also have a better understanding of their sequence of action involved during a fight. I have found that the reason for these spiders level high level of aggression is due to reproductive purposes. These spiders reproductive success depends on the access to prospective mates, and competition between male for mates is common in nature and conspecific often communicate during the agonistic interaction through threat displays. 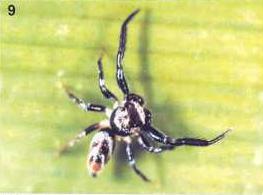 Normally when the male spider are not interacting with another male spider , it resumed a normal posture with its stationary legs arched towards its body( normal mode) as shown in Pic 1. However, when it encounter a male conspecific as far as 14cm , its natural instinct is to face each other with a defensive and alert stance and approach each other . In this Stance, the palp are spread open to send visual cues to opponent to show off its size and hence prowess(Pic 2) (Daiqin.et al,2002). In some cases, opponent may sense the threat and decamp ( escape). But in some cases, opponent may persist and approach the hostile spider. Usually in such cases, both spiders are seemingly equal size or slightly different in size and a fight will most likely breakout between them. In the picture below(Pic 3), it shows two spider with fully extended palp ready to engage in a battle. This stance is to fully exaggerate their size and intimidate the opponent before the fight(Daiqin.et al,2002).. 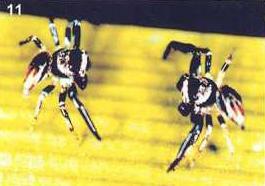 The spiders in this position will slowly inch in a forward and backward motion towards or away from each other while maintaining their sparring stance. However, usually the primitive spider will remain stationary keeping visual contact with the invading spider while the invading spider approach the primitive spider (Daiqin.et al,2002). 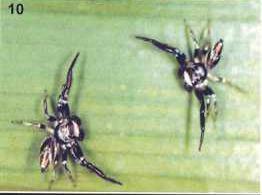 Next, when they are finally within a body length from each other , their palp are arched and their abdomen are tilted even more towards one side( pointing up or down) and the resulting position is that both the spiders appear elevated rather than in a flat position. From this distance, one or both spider will moved closer together and paused momentarily face to face (Pic 4) and embrace to engage in a fight. In this process of sparring, tactile cue are used to transmit information about the contestant’s strength and endurance( Rashid. et al, 1992) This allow the spider to assess it’s opponent prowess and decide whether it could win the fight. The fight usually break off when one of the spider decamp (escape) or when the other party is killed (rare cases). The spider will emerge victorious when his opponent decamp. Although watching Fighting Spider fight is interesting, we should not watch this fight as a form of pleasure. When fight break out, these spiders may get injured or may be killed, hence it is cruel to induce fight between these spiders just for our curiosity and leisure or for gambling purpose. As mentioned, I used to keep fighting spider as pet. This was because I was fascinated by its fighting behaviour. I often bring them to challenge my friend spider for the sake of fun. However in one uneventful fight, I lost my favourite spider named “ Bison” when it was killed during a fight. I got so sad and decided to gave up the rest of my spider . It was then that I decided human-induced animal fight is a very cruel sport. Walt Disney’s 1958 nature documentary ‘White Wilderness’ had depicted lemmings (such as the Norway Lemming, Lemmus lemmus, shown in the picture below) committing suicide on a massive scale by cliff jumping. 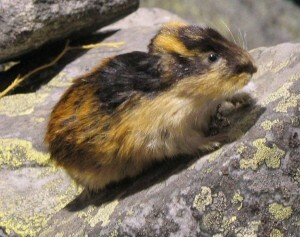 In actual fact, what is often regarded as a collective suicide in the lemmings are a misinterpretation of a “desperate massive migration (due to demographical boom, competition for food and geographical constrain) during which many die throwing themselves into the rivers, lakes and sea” (Anitei, 2007). Humans have also noticed ‘suicides’ in the Mantises order of insects such as the European mantis, Mantis religiosa. Some female praying mantis, as shown in the video below, eats the male while copulating. Such cannibalistic mating process “only occurs 5-31% of the time” (Doughty, 2002). It is shown that male praying mantis carry out active risk assessment and change their behaviour to reduce the chance of being cannibalized. In both cases shown above, death is not caused by an intentional act of voluntarily ending one’s own life. 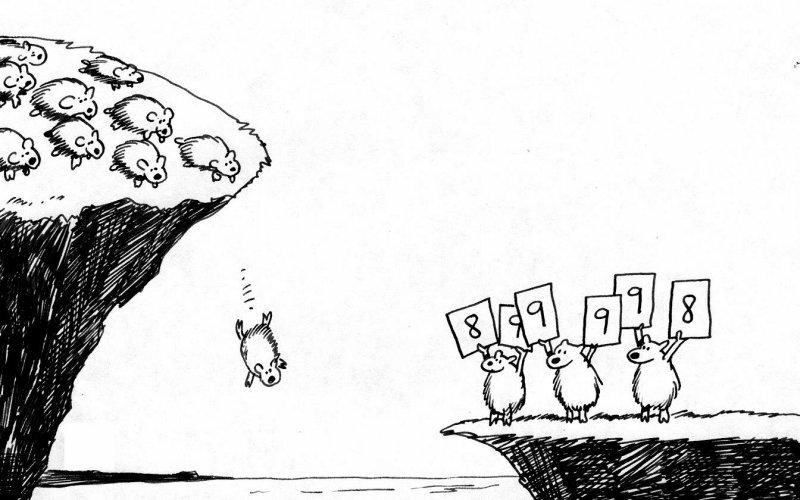 It might be indeed that in some cases, animals seem like they did commit suicide. It has been reported that some Philippine tarsiers, Tarsius syrichta, were so “traumatized by captivity that they killed themselves by beating their heads against the cages” (Philippine Tarsier Foundation, n.d.). Some animals die because of their own intentional acts or inadvertently but it is difficult to conclude the act as an act of suicide. 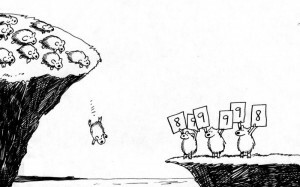 Furthermore experiments looking into whether animal suicide does exist would raise many ethical concerns. Therefore it cannot be generalised that animals do commit suicide. It does not live in a pineapple under the sea. It does not work at the Krusty Krabs. And it definitely does not wear square pants. Spongebob is not its name, but you can call its scientific name, Porifera, or simply as Sponge. 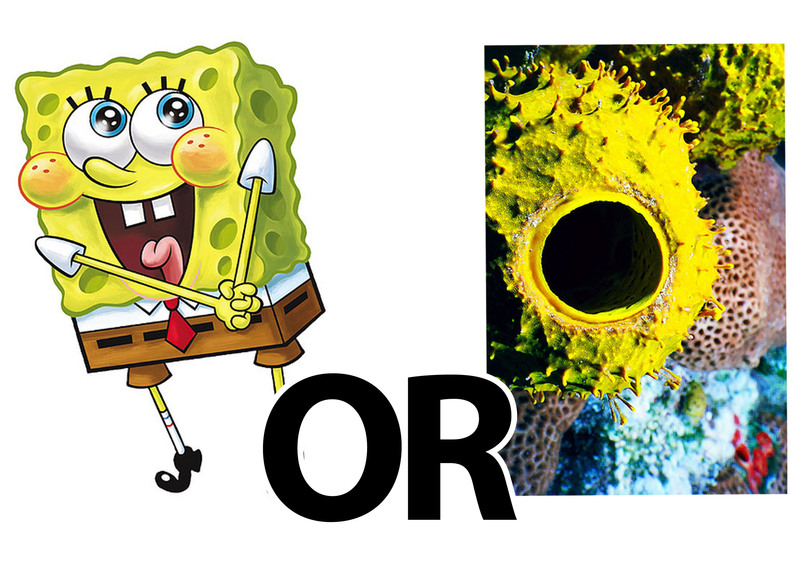 Unlike its TV cartoon persona, Sponges are simple animals with no brains and has over 5000 species. Unlike its TV cartoon persona, most Sponges are hermaphrodites, meaning they are both a boy and girl. Instead of living in a pineapple under the sea, sponges attach themselves against sea walls and rocks deep in the ocean and feed by filtering the sea water. Unlike corals, sponges do not rely on sunlight to survive and hence are found in abundance at the deeper depths of the ocean. And as their name, Porifera, suggests, these pore bearing creatures filter the sea water for food and nutrients for itself, while releasing the filtered water back into the ocean. Well everyone knows Spongebob Squarepants and hopefully after this, they learn more about the sponge and less of the nautical nonsense of that show. So maybe we need to change the words of the theme song? Who lives on sea walls under the sea? Absorbent and yellow and porous as it! If nautical knowledge is something you wish! Then go on your PC and google for it! Ever watched those horror movies where a parasite controls the thoughts and action of its human host, turning it into a mindless zombie in the process? This could be merely a work of fiction in the world of movies and horror tales but for snails from the genus Succinea found in Europe, the reality of turning into a mindless zombie is very real. The green-banded broodsac,(Leucochloridium paradoxum) is a parasitic flatworm that uses gastropods such as snails as its host for part of its reproductive cycle. The snails ingest the eggs of the adult worms from bird droppings. As for how the eggs ended up in bird droppings, I will explain it further in my last paragraph. As the egg hatches, the larvae travels into the digestive system of a snail to develop into the next stage, known as the sporocyst, it grows into long tubes to form swollen “broodsacs” filled with tens to hundreds of cercariae . These broodsacs invade the snail’s tentacles, generating a brilliant transformation, of the tentacles, into a swollen, pulsating, colourful display that mimics the appearance of a caterpillar or grub. The broodsacs pulsate according to the availability and intensity of sunlight. Uninfected snails generally prefer to seek dark areas to avoid predators but infected snails seem to have an impaired judgement when it comes to light detection. Snails in this case tend to move towards area of sunlight whereby predators such as birds would easily detect it. 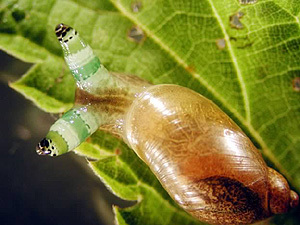 This is precisely the aim of the green-banded broodsac as it wants the bird to consume the swollen appendages which were formerly the snails’s tentacles. Once consumed, the cercariae develop into adult distomes in the digestive system of the bird. These adult worms sexually reproduce and lay eggs that are released from the host via the bird’s excretory system. These droppings are then consumed by snails to complete the life cycle of this parasitic worm . Therefore, for the green-banded broodsac to reproduce, it must ironically be consumed in order for it to fufill its parasitic role. So much for zombie movies, green-banded broodsac really makes snails into mindless gastropods! DeLaCruz, D. 2003. “Leucochloridium paradoxum” (On-line), Animal Diversity Web. Accessed March 23, 2010 at http://animaldiversity.ummz.umich.edu/site/accounts/information/Leucochloridium_paradoxum.html. The brush-legged wolf-spider (Schizocosa ocreata) is only 1 out of the more than 2000 species of wolf spiders. Males of the brush-legged wolf-spider have dark pigmentation and tufts of bristles on the tibiae of their forelegs – a conspicuous secondary sexual trait. They employ multimodal courtship display (visual, vibration and semaphore) to attract females for copulation. It was wondered if the tufts or bristles of hair have any impact on females’ preference for mates. It was found that the tufts made the courtship message easier to detect by females and the removal of the male spiders’ tufts on their forelegs only had an impact when the females could see the males but not feel the vibration signals. In fact, under circumstances when both visual and vibration courtship displays are detected, “female receptivity do not vary with the presence or absence of tufts”. Instead, females mated more often with males who initiated courtship first and put in more effort in courtship display (lifting their legs up and down in a slow manner and not just wavingof legs). All these findings suggest that courtship effort is a better predictor of courtship success than ornamentation (tufts of bristles) of brush-legged wolf spiders. I find this interesting and unique because in most other species, certain physical traits (particularly more attractive “ornamentation”) in males are preferred by females. For example, for the male fiddler crab, the bigger and brighter its claw, the sexier females find it, as it is an indication of its fitness. Thus, selecting “quality mates with good genes” is a part of natural selection. However, there are times in which we should look beyond the exterior to examine what is really underneath and not judge someone (whether animal or human)solely based on physical traits and appearances. 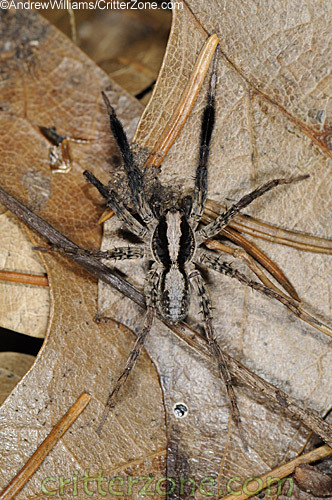 Humans too, can take a leaf from the brush-legged wolf-spider (Schizocosa ocreata) when finding a mate. Article – Wolf Spiders” by S. Hart. Animal Communication Project, 25 March 2003. URL: http://acp.eugraph.com/spiders/wolf.html (accessed 30 March 2010).